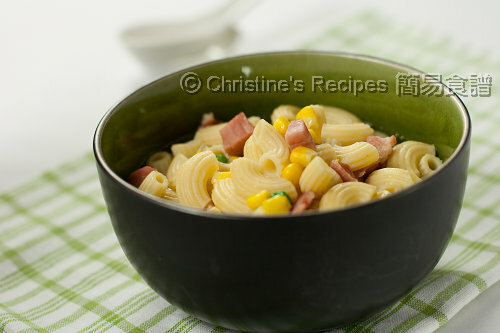 Macaroni soup with ham (火腿通粉) is my favourite Hong Kong Style breakfast dish that I grew up with, so comforting and delicious. You can pop in any favourite vegetables. I threw in some frozen corn kernels and green peas for convenience. This macaroni soup plays an important part in the popular breakfast sets available at any traditional Hong Kong cafés. The cafes normally offer 3 to 4 different breakfast sets for their customers to choose from. It could be fried eggs with sausages and sandwiches, or scrambled eggs with toasts. Typically, one or two breakfast sets would include a macaroni and ham soup. It’s downright simple as well as comforting. I loved this macaroni soup because it associates with my childhood memories. In many chilling mornings, my father and I liked to have breakfasts together in a cozy, local café near our home. We chatted over breakfasts before we went apart. After breakfast, he went north to work, I went east to school. The macaroni soup was my favourite choice at that time, as it energized and warmed me up. I couldn’t have the exact macaroni soup with my father again, yet my heart still feels the warmth when sipping the soup. Cook the macaroni according to the package instructions. Drain well. Set aside. Soak green peas and corn kernels in boiling water for 3 minutes. Drain well. Use a deep large pot, add chicken stock and water. Bring it to a boil. Add macaroni, ham, green peas and corn kernels. Continue to cook. When it boils again. Season with salt and pepper. Drizzle a bit of sesame oil on top. Serve in individual bowls immediately. 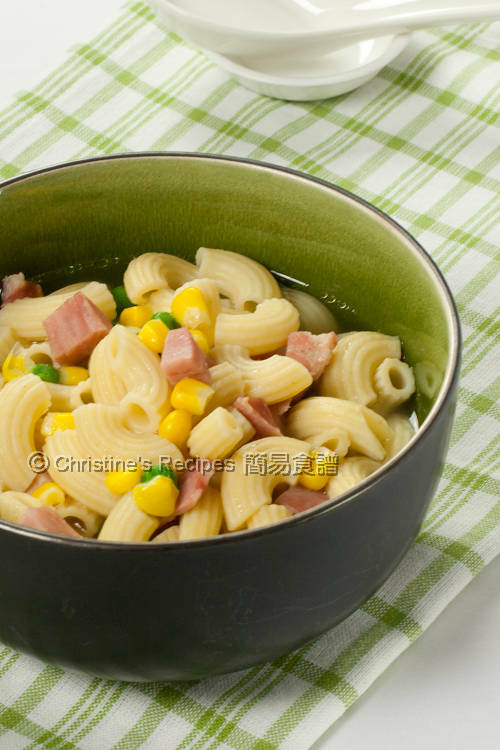 The macaroni soup that served in Hong Kong café doesn’t contain any peas or corn kernels, only with shredded ham. As for personal preference, I diced the ham to match with peas and corn kernels. You might like to use home made or bought chicken stock. I used Swanson chicken broth for a quick fix. MMmm this looks great. I had never throught of eating Macaroni for breakfast but I might just give it a go. this is an interesting east meets west recipe! How I wish I can have this delicious macaroni and soup after having too much meat during the holidays! I remember that my mum used to cook this for me whenever I had fever. But yours certainly look appealing! My MIL made something similar all the time! Such lovely comfort home-cooked food. But I doubt how many traditional HK cafes would present as nice as this : ). I sure this soup is made with lots of love too. It looks so homey and comforting! this would be a very comforting meal..i've been eating fried noodles and seafood for the past 2 days. I used to hate it when my mum made this - I never liked the large chunks of ham she put in all my noodle soups, and I used to think it was a weird recipe in our household. But now that I'm older, I'm coming around to the idea of ham in noodle soups. I always make this for myself and/or my husband when we are home sick with the cold or flu. I learned from my mum! This is the ultimate comfort food when you're under the weather. Well, either this or congee. Wondering how many people will this recipe serve? 250g is the weight of dry macaroni? Recipe sounds delicious. Looks good. I might make this for my parents one day...! So interesting that there doesn't seem to be any Asian influence in this breakfast soup - what kind of ham is used? Whenever I cook this dish, just grab any ham from supermarkets when it's on sale. The leg off the bones is the best I tried so far. My dad used to make it for us for Saturday lunches when we were kids and used Chinese preserved vegetables (my favourite part!). I woke up to a very chilly morning in the States! Wanting to give my little ones a warm, healthy breakfast, I googled "breakfast soup." Most of what came up were from Asia and I don't have the ingredients. This, though, is perfect! I have everything and it's just American enough that my kids will eat it!Thanks so much for taking the time to post this recipe.